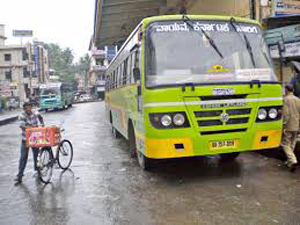 Udupi, July 7, 2015 : Udupi has long been a district headquarters, a major pilgrim centre, a tourist destination and an education hub, but it still does not have a KSRTC - Karnataka Road Transport Corporation Bus terminal. The KSRTC Bus-Stand functions from a building of the Udupi City Municipal Council (CMC), since about 11 years, under the Karnataka Urban Development and Coastal Environment Project. The CMC has rented out the bus stand to the KSRTC. The former looks after the upkeep of the bus stand. At least 200 buses pass through this bus stand daily, while 26 buses originate from Udupi. Yet there is no bus stand to fit the need. Buses have to wait out for space inconveniencing and delaying passengers apar from posing a danger to people. The bus traffic is mainly very high from 6.30 p.m. to 9.30 p.m. at the bus stand. Most of these are long distance buses. The Traffic Controller in charge said that chaos prevails as there is space is space for five buses only at a time. The Traffic Controller’s Office is located in a small congested room in a corner of this bus stand. The reservation for long-distance buses is also done in this office. Consequently the cash collected for tickets reserved is kept here without proper security. There is no rest room for drivers and conductors of long-distance buses at the bus stand. As the bus-stand belongs to the CMC, the KSRTC does not have control over it. A suitable terminal is the urgent need now. Proposal to construct the KSRTC Bus-Stand on three acres of land in Bannanje here has been pending for over 10 years. The proposal is to hand over three acres of land, which belongs to the Public Works Department (PWD), to the KSRTC for the bus stand. Udupi DC Dr. R. Vishal, said that the matter was pending with the PWD. He has already written to the Principal Secretaries of both PWD and Transport Department to transfer the land to the KSRTC as soon as possible. Udupi is quite a big city and KSRTC bus depot is a must. Drivers are the one who help the people to move their desired destination safely,When they themselves dont have place to take rest when they are tired, with what risk should the people travel with them?The Governmemt has to seriously think over it.